Description of "nether Issue V"
Issue 5 of nether includes poetry and prose by Vivek Narayanan, Gopal Honnalgere, Subimal Misra, Arun Sagar, Dominic Alapat, Jerrold Yam, and many others. 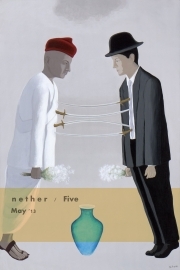 nether is a journal of contemporary literature and art from Bombay, India. Reviews of "nether Issue V"